OFFERING FOR SALE –This offering totals 32,925 square feet of gross developable land within the Lynn Creek Community Plan. The land assembly includes six lots currently zoned RS4 single family. 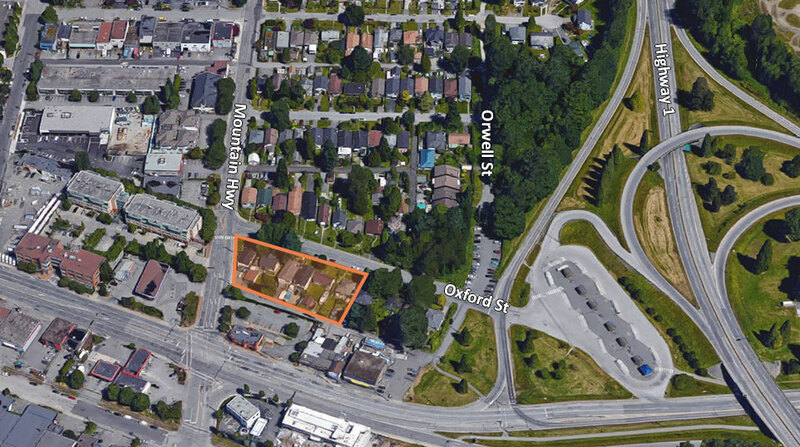 The successful applicant can apply to re-zone this site for multifamily use in accordance with The District of North Vancouver’s Official Community Plan. The subject site: 220 Mountain Highway and 1515-1555 Oxford St, North Vancouver, BC, is located just west of the Iron Workers Memorial Bridge onramp. This development opportunity boasts easy access to the Number 1 Highway & nearby amenities such as grocery stores and strip malls. The site is located directly across from the Phibbs Exchange transit station offering the future development the ability to boast a Transit Oriented Development (TOD) theme as a driving benefit for the approval process and end users.